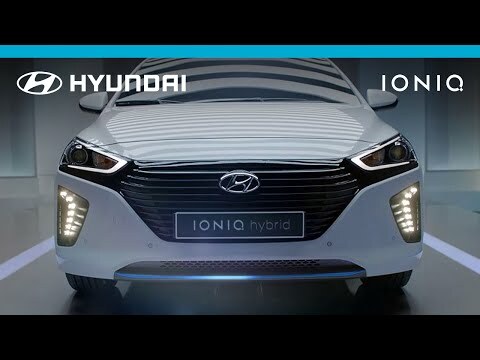 The new Hyundai IONIQ is a game-changer in the electric car segment. For the first time ever with this model, you have a choice of hybrid, fully electric or plug in hybrid drive trains. The IONIQ's dynamic and exciting handling characteristics also eschew the notion that electric cars can't be fun. The sleek profile of the IONIQ does more than just provide great style and kerb appeal. Its silhouette has been carefully designed to provide the best possible aerodynamics for reduced drag. In fact, the drag co-efficient is just 0.24 which, when combined with the many weight saving materials used in its construction, makes the IONIQ incredibly efficient. Designed to be driver focused yet as clean and simple as possible, the interior of the IONIQ is as elegant as its exterior. Step inside and you are greeted by a swooping dash, TFT instrument and infotainment screens and an impressive array of standard features. Everything is crafted for your comfort, with no detail superfluous, so you can relax and stay in control trough every mile. The three drive trains offered in the Hyundai IONIQ are designed to provide the best possible efficiency and performance, depending on your needs. Hybrid models allow for greater range, making them ideal for longer journeys while still returning up to 83.1mpg. Fully electric models offer zero emissions and a real-world range of 130 miles, so they’re perfect for city driving. For the best of both worlds, choose a plug-in hybrid model. These offer 30 miles of electric only range, 26g/km of CO2 and a staggering combined fuel consumption 256.8mpg. Whichever you choose, you’ll not only travel in style, you’ll be doing your bit for the environment too. All IONIQ models are fitted with front, side, curtain and knee airbags. For optimal traction in all conditions, every IONIQ also comes with ABS, Autonomous Emergency Braking (AEB) and Electronic Stability Control (ESC). Discover the innovative Hyundai IONIQ today by booking a test drive at Turners Hyundai today. The teams at our Ipswich and Bury dealerships will be happy to assist you.